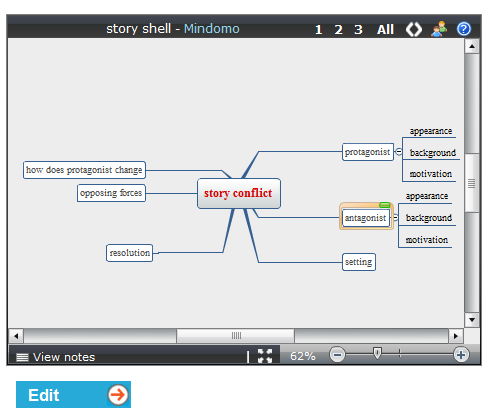 Mindomo is a versatile mindmapping tool which can be used for instruction as well as brainstorming. Your learners can use Mindomo for similar applications. In addition to being a visually intuitive mindmapping tool, Mindomo allows you to associate elements of your mindmap (designated as “topics” and “subtopics”) with assets (images and hyperlinked web pages) using the Mindomo toolbar. This greatly expands the utility of Mindomo as an educational tool. An example of a mindmap I create to outline the beginnings of a short story is shown below as it appears on my Creaza homepage. The Cartoonist tool allows you to create comic strips using a set of pre-designed backgrounds, characters, and props as a starting point. However, you also can create your own backgrounds and characters and download them from your multimedia page. As an instructor, you can use cartoons to gain your learners’ attention through humor and storytelling. You also can use Cartoonist to create examples of scenarios for further discussion. Your learners can use Cartoonist to create their own stories and scenarios (for example, to demonstrate how they’d tackle a problem). The MovieEditor comes with a library of assets (video, images, audio files) but you can also add your own via your media files page. You can edit video, add images and text and create transitions between your inserted media files. This is a great free tool that provides many ways of creating and editing videos. It’s useful for creating instructional videos to engage learners and it’s useful to allow learners to create their own video stories. You also can use it in conjunction with other free screencasting tools to edit computer simulations. Audioeditor is an online audio editor for recording and editing audio and for mixing different audio clips. You (or your learners) can use AudioEditor to create and edit audio for MovieEditor movies. You also can use it to edit podcasts. Recording is an option in the full version of AudioEditor which is not free. All of the Creaza tools work together nicely to allow you to create digital stories though you can certainly use them separately. As mentioned above, you can share your creations or keep them private. You can make your creations accessible via your homepage but you can also embed them in a web page as well. Differences between free Creaza tools and the Premium products are listed here. More tips and tricks for using Creaza are described in the Creaza blog. This entry was posted in Creaza and tagged animation, audio editing, brainstorm, brainstorming, cartoon, Creaza, digital storytelling, free tools, mindmap, mindmapping, movie editor, screencasting, Web2.0 tools. Bookmark the permalink.